Closets come in all shapes and sizes, and sustainable closets are no different. Some are small with capsule type wardrobes while others, like mine are the sign of a maximalist who doesn’t subscribe to the one in: one out theory. Many of you know that my husband and I bought a home two years ago that we spent just over a year renovating. It was a complete overhaul which means we got to decide the new layout. When faced with a dirty attic that was previously used for storage I took one look at it and said, “We don’t need the storage. Let’s make a closet.” This is how my wardrobe came to be roughly 250sqft. It is a big walk-in and I know it! But the space afforded me something I have always wanted: a non-seasonal wardrobe. Living in New England layering is a must. Heavy coats, rain boots, snow boots, hats, scarves, shorts, tank tops, blouses etc. Growing up we were taught every six months (give or take) to pack things up, put them in storage, and then bring them out again when the temperatures either rose or fell. I have always disliked this approach to wardrobe organization. Boxes were inevitably misplaced or never opened each year. And, having moved so many times I had boxes and bins spread over several locations. So when I finally got the chance to design my own closet I went for an all-inclusive approach. Never again did I want to pack and unpack. My closet is now non-seasonal. Winter coats sits next to workout gear which sit next to summer tops. I can see everything in one place and never have to worry about playing the guessing game of "where is it?". Being able to see everything also holds me accountable for not only how much I own but how I often I wear certain pieces. 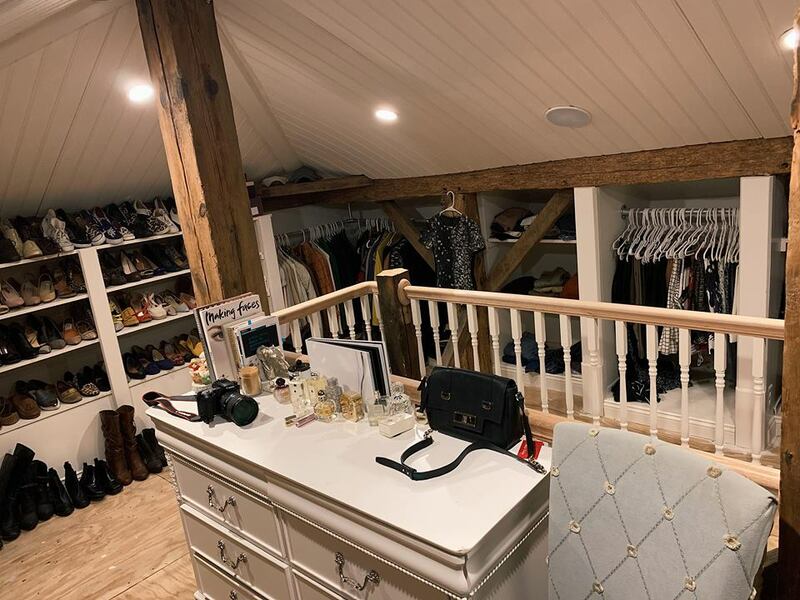 While using an attic is a great way to maximize the space you have it presented a few challenges. Lighting, room height, and existing structure were just a few. Putting in skylights wasn’t an option in a home from the 1700’s – at least not an option that maintained the historical character. I opted for LED recessed lighting. In the future tube lights may be an option. There was also nothing to be done about the room height. To compensate for the space, we recessed the shelves into the eaves allowing for the center of the room to stay open giving the allusion of height. But, in reality I have to bend my head down to get into many of the spaces. One of the things I love most about this house are the original beams but they proved a challenge when designing the room needed for hanging and shelves. Instead of covering them up we chose to work with them, highlighting their charm and originality. As you can see my closet is far from finished. The floor needs attention and the shelves need a final overhaul. But, like the rest of the house my closet is a work in progress. Yes, there are. I strive towards a sustainable closet and lifestyle everyday but that doesn’t mean I didn’t once have bad habits. My hangers are plastic (although to be fair most of them were found at yard sales and *gasp* in other people’s trash – why would they throw something out that was brand new?). 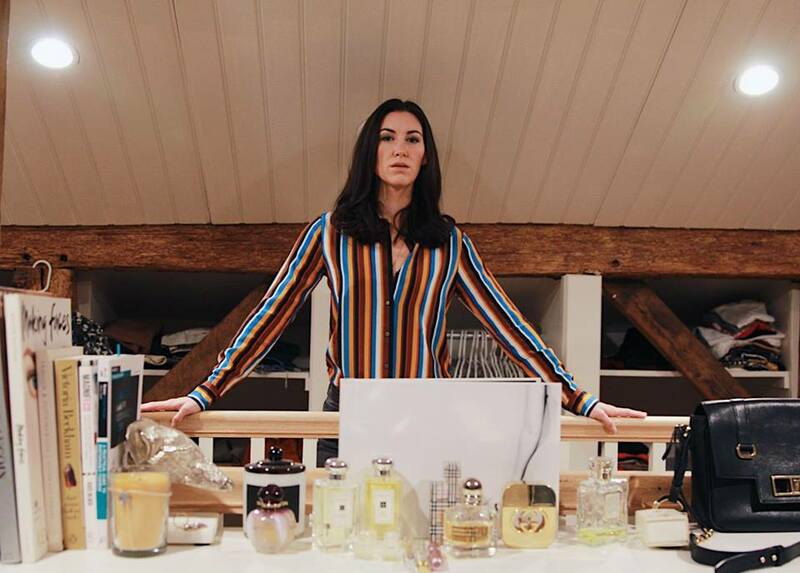 My perfumes are hangovers from the days when I hadn’t yet ventured into the world of clean beauty. I refuse to throw things out if I am still using them or just because someone or some article says so. There is an accumulation of clothing, shoes and bags from fast fashion companies. Some of these have been thrifted in recent years but the majority are quite old. I will freely admit that for a couple of years, about eight years ago, I definitely had a bad fast fashion shopping habit. The oldest purchases, still in my closet, go back almost 15 years. I still wear them so why get rid of them? The most sustainable thing we can do is to wear what we already have and my closet is a reflection of that. I have no qualms about wearing older items that weren’t made in a sustainable manner. Moving forward with purchases I now know better, but I didn’t always. Instead of dumping these items in the trash or sending them to already overwhelmed thrift stores I choose to keep and wear them with pride and a tinge of nostalgia. 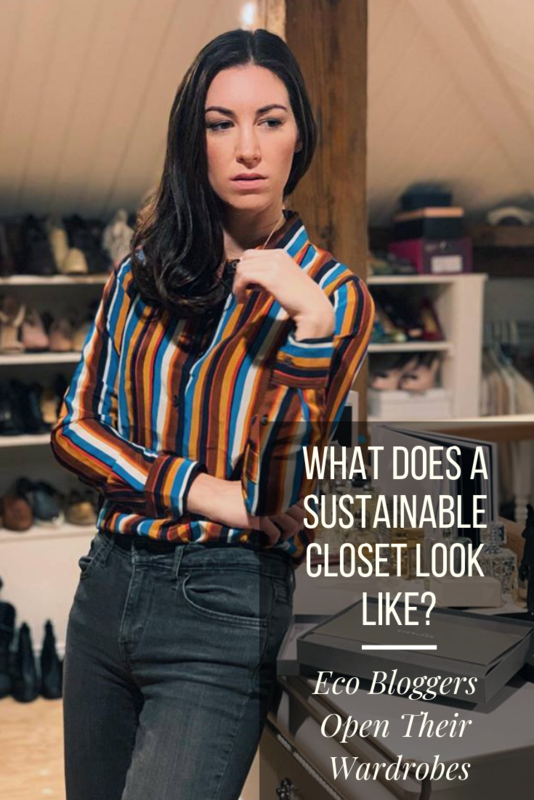 If my closet is full of non-eco items how can I call it a sustainable closet? I’m not sure I would classify my closet as sustainable. It’s not full of items that have only provided fair labor and wages and are good for the environment. It is bigger than the average closet meaning that one day, these items will end up either in a landfill or at a thrift store. It is however, full of items I love. There are shoes which have scuff marks on them from years past yet I still wear them as if they were brand new, with pride. There are dresses from my mother and hats from my grandfather. There are bags from strangers I will never meet. 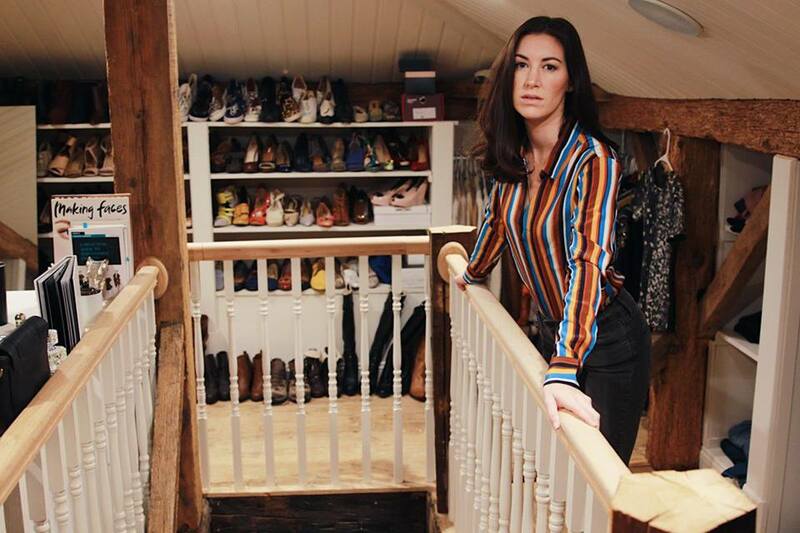 I could categorically tell you about every item in my closet. I can also tell you every purchase I make moving forward is a reflection of a sustainable closet. On average I buy about 10-20 new items a year. These are mixed and matched with previous items. As I mentioned, I don't subscribe to the one in: one out philosophy. It's a philosophy that has never sat quite right with me. If I still wear the pieces and I have the space for them then why should I discard them? Instead I wear and re-wear items with a sense of love and history. Each garment and accessory tells a story that is unique and personalized. 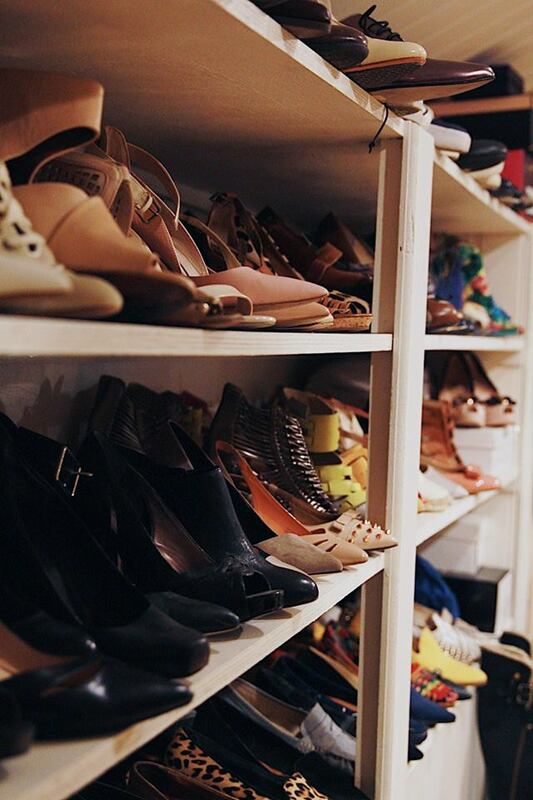 You don’t need 250sqft of space for a wardrobe. Most importantly work with the space you have and keep it organized. Wear what you have. Love what you own. 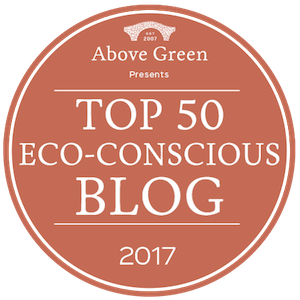 When it comes to sustainability wearing what we already own is the number one thing we can do. We've all made shopping mistakes in the past. It's what we do with those items that matters now. Moving forward, we need to learn to love what we own. Not in the trendy sense but in the true sense of personal style. The same holds true for new purchases. If you’re not sure about an item in the store your mind won’t change once it is in your wardrobe. By bringing in items you truly love you will wear them over and over again, year after year. For me, thrifting takes on three different meanings. Essentially it is clothing or accessories that are second hand. These could be borrowed from a friend, bought at a thrift store, or handed down from friends and family. Will the shirt be worn out in just under a year? Can you get the shoes resoled? Pay attention to the materials and their longevity. If you’re bringing in only the items you love, you’ll want to know that they can be repaired and patched down the road and don’t wear out quickly. If you love your pieces, you’ll want to care for them. You’ll want to know that they are folded neatly into their individual spaces. Closets with clothing piled up on the floor or on the dresser are a sign of items that aren’t loved. Sure we all have our days (I absolutely detest doing laundry and thus a pile builds up every once in awhile) but on a whole we treat the items we love with respect. Our clothing is no different. Buy new items with intention. Do you really need it? What purpose does it serve? How was it made? What is it made from? Who made it? Where did it come from? How long will I want to wear this? What will I do with it when I no longer want it? I understand this can feel like an overwhelming amount of questions to ask – after all it’s just clothing. But, clothing is more than just a garment we throw on each morning. It is an outward symbol of who we are, what are values are, and what we stand for. Buy consciously with intention; take a stand. A sustainable closet doesn’t look any different on the outside. It is what is on the inside that makes it unique: how we treat each item, what we bring in, and our attitude towards those pieces. 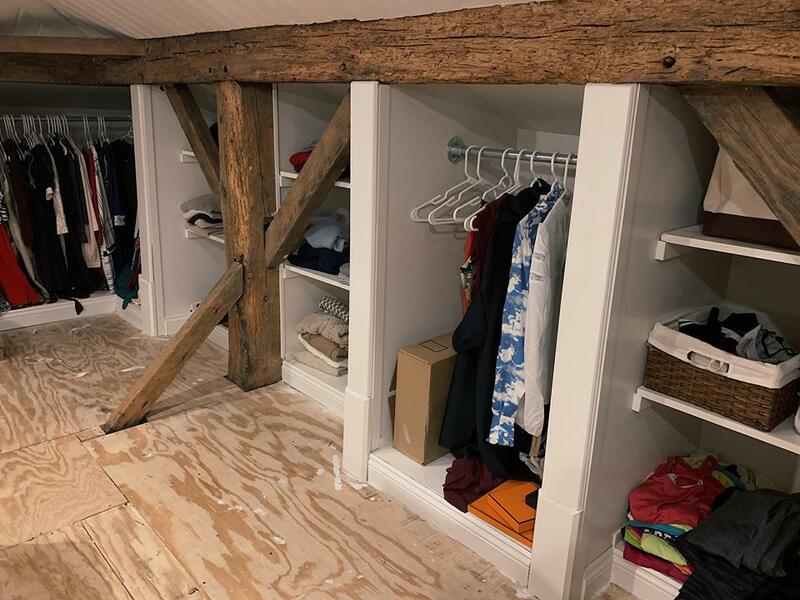 A sustainable closet is built with a particular mindset not with budget or space. What a dream! Loe it, such a great idea, well done! I think you are fitting your solution to the problem. You have been doing that for a while to make yourself feel better about owning excess perhaps ? Going by this logic, every human on this planet can claim the same. Problem solved. Congratulations ! You don’t have to write this blog anymore. A good question to ask yourself : If every human consumed as much as you did, can the planet sustain it ? Thank you for taking the time to read the post and I think I understand where you are coming from. Given the current statistics on how much the average consumer spends each year, I under consume by a lot. My closet is a reflection of clothing that has been collected over the past two decades without sending much to a thrift store over those years. I believe clothing and accessories that we bring into our closets need to be there for the long haul. I invest in pieces that I perceive will last a lifetime in both style and in quality. As I mentioned in the post on average I add 10-20 new items annually. 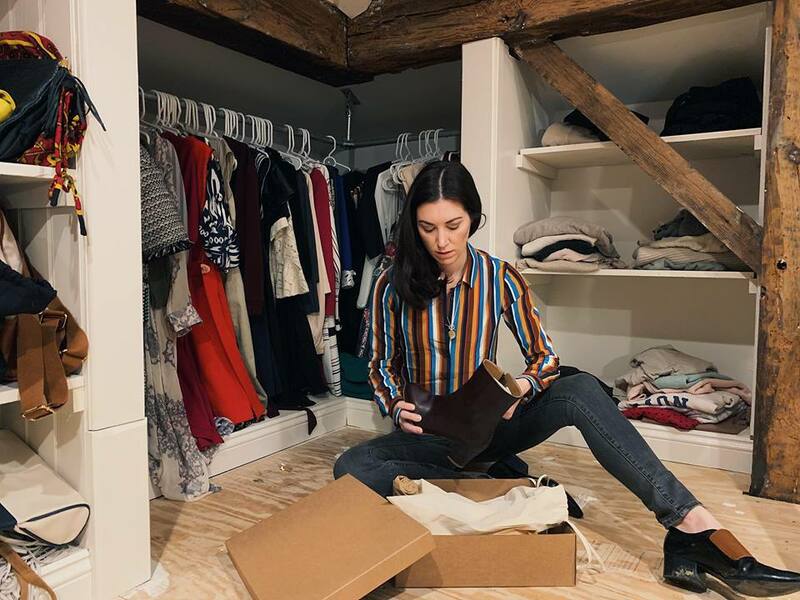 Most of what comes into my closet these days are from thrift stores – helping to remove potential waste – and, the pieces that are new come from sustainable brands who pay attention to both the labor force and the environment. I can certainly understand your concern but I also hope you can appreciate my approach to my closet. I certainly do not think it is okay to mindlessly shop nor do I support the fast fashion model of disposable clothing. I think we need to learn to appreciate what we already own and wear it with pride, which was my main point of this post (maybe it didn’t come across clearly) instead of adding more new things each month/year. Wearing what we already own is the most sustainable thing we as consumers can do. Dream!! so perfectly organized. 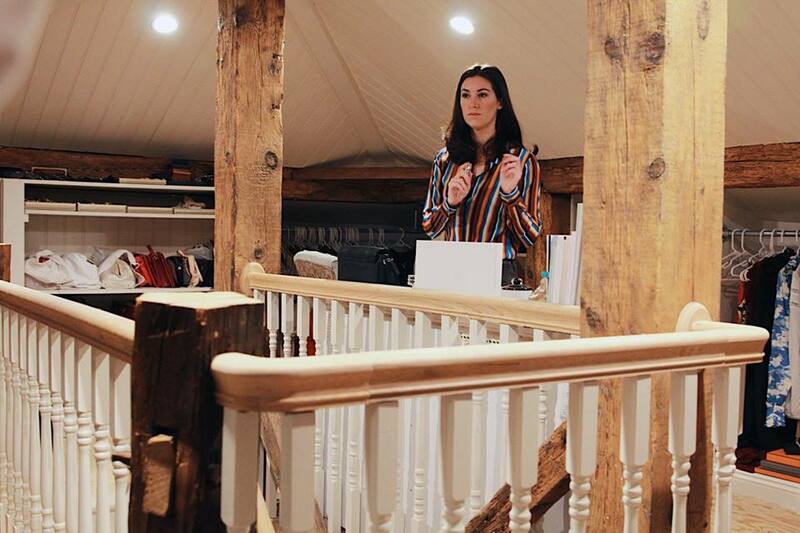 So you get dressed in the attic? I do! But the staircase is opened to our bedroom so it feels more like an extension of the room rather than a creepy attic. This is such an excellent post! I absolutely agree and am quite horrified when people are just throwing all their clothes away that aren’t ethically and sustainably made when the best thing they can do is to get use from the item and as many wears as possible to justify the resources used to make it. 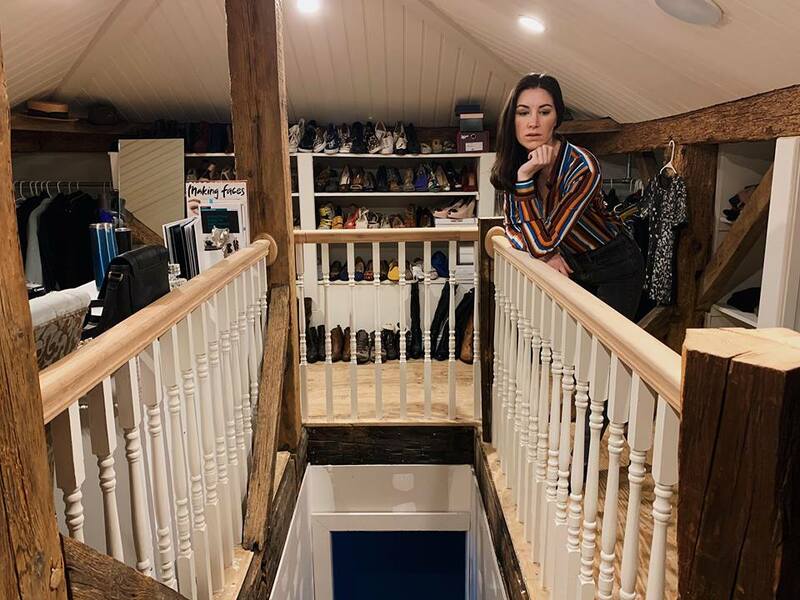 I love how your wardrobe looks like, so spacious and cosy! I really enjoyed reading this and particularily resonated with your reasoning behind keeping things because you have the space and still love your clothes. I will never understand how a minimalist wardrobe is sustainable if one wasn’t minimalist to begin with… and has to get rid of things first. 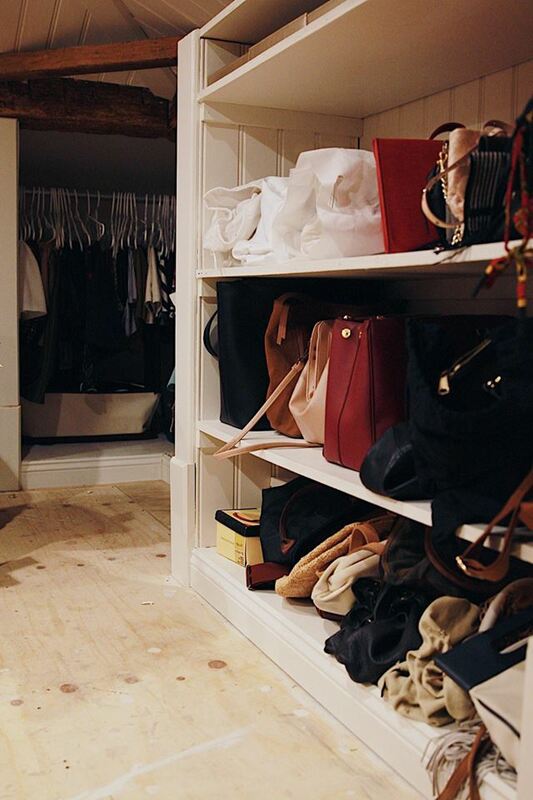 As a tiny house dweller and not necessarily a minimalist, your closet is a dream too! I’m inspired!